#1: I’m livid all the time. Why? My dad died. My mom barely talks. My brother abandoned us. I think I’m allowed to be irate, don’t you? #2: I make people furious regularly. Want an example? I kissed gorgeous Jamie Forta, boyfriend of the coolest cheerleader in the school. Now she’s out for blood. Mine. #3: But most of all high school might as well be Mars. My best friend has been replaced by an alien…and now it’s a case of survival of the coolest. "About the occasional panic attack and being fourteen in the suburbs without a mobile phone. Read It And Weep." Rose is my new best friend and she doesn't even know it! I loved how down to earth she was - how real she seemed and how extremely easy to relate to she was in more ways than one. I originally only accepted this book for review when I read 'panic attack' on the blurb because I wondered how an author would portray a character who suffered from something which I also endured; I was impressed with how Rozett handled Rose's anger issues and was surprised (in a good way) about how Rose wasn't this 'hot under the collar' brute who threw her weight about when she didn't get her own way, but whose anger was mostly silent and only made itself known when she was pushed over the edge - the thin line between being angry and being upset is shown very clearly in this book. I always found myself experiencing the same emotions as Rose in each situation she was in. The guilt, the betrayal, the anger stirring in the pit of her stomach, I felt it all. I suppose I expected an aggressive protagonist, but instead I was presented with Rose. The plot moved at a good pace, never was I bored, even despite not that much happening. The story is driven forward by emotions and characters and everything was necessary, nothing was just thrown in for the sake of it. 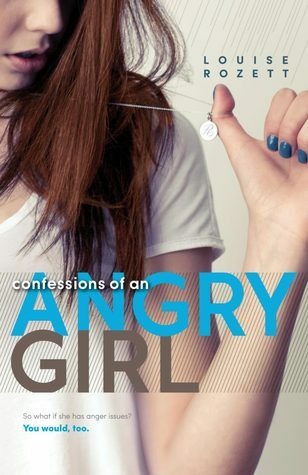 I'd sum the book up to be about a young teenage girl struggling to smother her anger at life (and what it can take away from you) while trying to survive high school with boys, cheerleaders, friends and a whole bunch of personal boundaries thrown in there. The sparks of romance in this novel are awaiting to be ignited in the sequel! Being just fourteen, Rose isn't 'experienced' so you follow her as she learns all these new feelings, both emotional and physical. The realism of Rose's situations and her reactions made this book all the more enjoyable. I loved this book! There's not really much more I can say without spoiling it but I loved Rose and I can't wait to read the sequel! I recommend it to all! A must read for me! Thanks for sharing.